I bought axe 2 in 1 for my husband to use, because he doesn't care for what us girls use. He didn't like to use our feminine scents and I can't blame him there! He has tried a lot of the scents and has so far liked them except for one I can't recall the name. I think Phoenix was one of his favorites, they smell good and they even make a 3 in 1 with added use of being a body wash too. He's going bald on top, and can't use anything too drying or his head peels. This doesn't. He likes the softness of his hair and I think it's very clean and shines and he has a job where he gets very dirty. I reccomend it although smelling them before buying is a good idea, some of them are potent and very different scents. This is another product that I absolutely love. Every thing about it to me is fantastic. The way it makes my hair feel when I use it. The way it smells is amazing and the way my fiance loves the smell of it is even better. The only two drawbacks that I can see is that there are other products that do a much better job of cleaning styling products out of your hair and there are other products that go a little further but for usage when my hair is short and I don't need to style it I think Axe is my favorite because it is a little less expensive and leaves my hair soft and smelling great. Effectiveness it does not do a great job when I am using styling products but for the cost it is the best product I have found when my hair just needs general cleaning. It does soften my hair quite a bit and since it is a 2 in one product it makes it much easier and takes up less room in my shower. Scent I Absolutely love the smell. I like all the varieties and my fiance does too. I tried this simply because it was new to me and I didn't like what I had just run out of. In most instances I really have no preference of this sort of item. I normally let my wife choose to pick out what she likes for fragrance or whatever reasons. 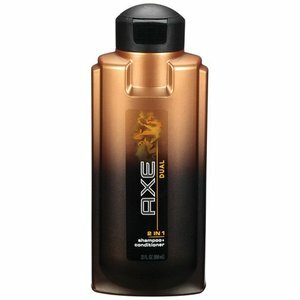 I chose this because I liked the smell and had use other AXE products and knew the quality would be good at very least. I also like the design of the top it has a push button type top that pops open when you push it. This simple feature is important to me due to the ease of opening with wet and arthritic hands. Another small good point that I found to be a pleasant surprise is that the design of the bottle stood straight up like a normal old fashioned bottle and did not sit on it's on lid, allowing it to drip and run wild upon opening, to later leave a sticky mess all over itself. Effectiveness The AXE shampoo/conditioner worked exceptionally well in regards to amount used and desired effect achieved with the conditioning. A small amount goes along way. The conditioning effect was very good, far better than I imagined any combo product could be, and I have tried a few. Scent I really enjoyed the scent it was pleasant and not overwhelming, with no sudden breathtaking puff of perfume upon popping open the top. I used to use axe deodorant and spray so I figured why not try out their shampoo. I was a little skeptical about it at first because I didn't think that the company could pull it off but I decided to give them a chance. I can't lie I was pleasantly surprised by how well it worked and how good it smelled. 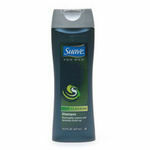 Since it is a combined formula of shampoo and conditioner it also helped me save a little money so that always helps. Effectiveness When it comes to cleaning your hair I feel like it is pretty effective and it also leaves my hair feeling fresh and clean because you can feel it working as soon as you apply it to your head. It may not be the most effective but it does get the job done for me. Scent The scent smells pretty good I have gotten a lot of compliments about it whenever I used so that made me feel like I made a pretty good choice. It actually lasts long unlike some of the other shampoos I have had in the past which is a great thing. My wife purchased this for me and I really like it. It leaves my hair feeling clean and soft. It has just the right amount of scent and works well with other Axe scented products. This shampoo also cleans the scalp well. It is definitely a real shampoo for men. I like having my own products and this is one I will continue to use. I think it is definitely made for men's needs. I highly recommend this 2 in 1. It is priced well and lasts. Effectiveness Cleans the hair and scalp well. Leaves the hair soft. Scent Just the right amount of scent. 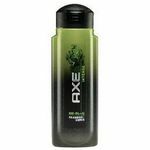 Axe is mostly known for the deodorants it makes, as well as those raunchy television commercials. But they do have some nice products like this particular one. Normally the two in one shampoos that combine a conditioner seldom work well, i know as i've have tried several before. This one is a clear winner. I was lucky enough to get this one on a discount as well as an extra 25% promotion offer. It lasted me real long and i have used it very often. It has a nice smell, not to overpowering , just perfect and yes it does make you hair quite soft. It takes up less space in your shower cabinet or your gym bag, as you just have on bottle to tag along. My only problem with this shampoo plus conditioner is that its a bit pricey. But then if you take into account that you wouldn't need to buy a conditioner it seems fine. For years I avoided buying Axe products because the Axe brand is pricier than the products I normally buy but with sons who are 15,14, and 12, I gave in to their requests for Axe. Axe 2 in 1 Shampoo works well on all of the hair, regardless of length and cut. Their hair looks clean, shiny, and untangled. Axe 2 in 1 Shampoo leaves their hair smelling great. My sons take more showers when they use Axe products! At Christmas time there are often Axe gift "combos" which usually have shampoo and antipersperant bundled together which makes for a great deal. Axe 2 in 1 Shampoo is well worth the extra cost because my teen and tween boys will actually USE it without my nagging! They look good and smell great using Axe 2 in 1 Shampoo! i like all things that give you double the value that they originally intend to. So i have a stock pile of reversible jackets and other two in one items and products. I was very happy when i saw this shampoo as i am a fan of the axe range of products and have always used them whenever i can. It was nice to see them take their conditioner and put it into the shampoo to make it one neat cheap shampoo bottle. The nice thing about the axe range of shampoos is, that it actually makes your hair very soft, and gives out a nice smell, though to some people it maybe be extra strong, i like the extra strong smell and am not a big fan of subtle smells. This shampoo works up quite a lather and in one go you have the shampoo business as well as the conditioner business all taken care of, This not only lands up saving you time but some money as well as you don't need to buy many bottles for the same function. Its not expensive and the bottle i bought had an extra 25% added on to it. I should have bought a few more as later i realized it was a promotional offer for this nice two in one shampoo. Washing your hair of course is an everyday part of life and ive been though plenty of them, including this 2 in 1 axe. To be honest i really don't see the big deal about axe. Yes it does smell very good and has a manly scent that will get noticed, but thats about all it really does and you can find alot of othet shampoos that smell just like this if not better. Plus the smell doesn't even last all day like it claims. 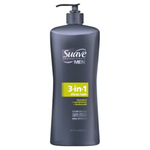 I will say this though it is nice and easy especially for us guys to have a 2 in 1 type bottle to get shampoo and conditioning all done at once but i really cant tell the difference between this stuff and other shampoo i use beside the price. Every time i go to the store i see axe at an extermely higher price then its compititors. Why should i pay that much when i can find another shampoo that works the same. Im not totally saying this is a bad product but i do think it is worth the very high price when a cheaper brand can do just the same. Overall i think axe is just priced a little too high for the results that you get. I have used the Axe brand of deodorants for a while now and find them pretty good, but i was never inclined to use any of their other products as i never associated them with the Axe brand. I was moving to a new apartment in nyc which had a very cramped bathroom, like most of the do. And i had these humongous costco type shampoo conditioner bottles which would just choke my shower shelf, so i decided to get rid of them and buy smaller bottles instead. In the market i came across the axe 2 in 1, it was the only one left so i assumed it was a popular buy and i decided to try something new out, i was very skeptical as a 2 in 1 is normally a scam concept for me. the price was decent and the bottle fairly large. The first time i used it my hair had this really nice smell, and once the hair dried up, it was really soft, i have wavy hair, so when it gets soft one can actually feel it. I was very happy with the shampoos result, the space it saved as well as the nice container and flip lid.